Posted on Tuesday, February 17th, 2015 at 8:35 am. Posted on Sunday, December 28th, 2014 at 10:39 pm. From now until the end of the year all used vinyl in Villa Park will be 10% off. We just loaded up the bins with some killer stuff. Head on over and check ’em out. We will be open from 10AM-6PM Monday December 29th to Wednesday December 31st. Stay tuned for more cool goings on in 2015! Posted on Monday, December 1st, 2014 at 10:30 pm. Posted on Wednesday, November 26th, 2014 at 5:39 pm. Here is a list of artists that we will have in stock on Friday. We will be in Villa Park (22 S. Villa Ave., inside Cornerstone Used Books). Doors open at 9AM. First come, first served. You will not be able to buy multiple copies of the same item. No hoarding! We want as many people as possible to be able to get items that they are looking for. We appreciate your understanding. Hope to see you there! Ramones, Jimi Hendrix, Flaming Lips, Beatles, Grateful Dead, Metallica, David Bowie, Judas Priest, Johnny Thunders, Dave Matthews Band, Jenny Lewis, Run DMC, The Doors, Ed Sheeran, Ben Kweller, South Park, New Order, St. Vincent, Disney: Frozen, Little Miss Sunshine, Big Lebowski, Velvet Underground, Green Day, Govt. Mule, Echosmith, Phil Spector Christmas, J Mascis, Peter Murphy, Game Theory, Billie Holiday, Penny Arkade, Husker Du, Ra Ra Riot, Bleachers, Ghosbusters Stay Puft, Conor Oberst, Mastodon, Wu-Tang Clan, Dio & Friends, Korn, Joe Satriani, First Aid Kit, “American Hustle” Soundtrack, Outkast, 5 Seconds Of Summer, Bon Jovi, Chrissie Hynde, Chvrches, Decemberists, Elvis Presley, Ennio Morricone, Faith No More, Five Finger Death Punch, Genesis, Imagine Dragons, Joey Ramone, Kinks, Korn, Little Richard, Miles Davis, Mother Love Bone, Game Of Thrones, Seth MacFarlane. Posted on Sunday, November 9th, 2014 at 3:36 pm. People have been asking. We are answering. Yes, we will be participating in this year’s Record Store Day Black Friday event (November 28th). It will be happening at the Villa Park location (22 S. Villa Ave.). The store will be opening up at 9AM. We are trying our best to get our hands on as many RSD titles as we can. Just because we ordered something doesn’t mean we will be getting it. We won’t know until a couple of days before what we will have in. If we have time we will post the titles we will have available. Check back to our blog closer to the date. 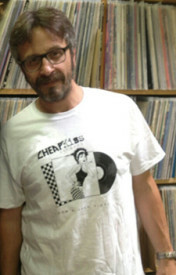 Remember the time Marc Maron visited? Posted on Thursday, August 7th, 2014 at 11:11 pm. Last summer we had the pleasure of comedian Marc Maron paying us a visit at the warehouse. If you listen to his WTF podcast or watch his show on IFC you know he’s a big vinyl collector. He was in town last summer for a couple of gigs and had some free time one afternoon so he made the trek out to Schaumburg and did some shopping. Super nice guy. Great taste in music. ’80s Alternative, Blues, Psychedelic, Punk, Classic Rock…he pretty much likes it all. On a recent episode of his IFC series “Maron” (which is a scripted series, but feels like a documentary because he’s pretty much playing himself) he invited a guy over to check out a new amp he bought for his stereo system. The album he tempted the guy with was Pink Floyd’s “Piper At The Gates Of Dawn”. Take a guess where he picked up that record. That’s right…Cheap Kiss Records! It was pretty cool hearing him talk about that record. We had no idea that was going to be in the episode. Caught us by surprise and brought smiles to our faces. The name of the episode is “White Truck”. Keep an eye out for it. Keep an eye out for his TV show and an ear out for his podcast in general. Real entertaining stuff. A Record Store Day Thank You! A big thanks to everyone that came out for Record Store Day! This was by far our biggest and best one yet. We couldn’t believe it when we showed up an hour before the doors opened and there was already a sizable line. You guys are crazy! In the best possible sense, of course. Behind the scenes things were a little bit nerve wracking. The last couple of days leading up to RSD we weren’t even sure we were going to have any records! The distributor was having trouble getting orders shipped. This didn’t just affect us. A whole bunch of stores across the country were on pins and needles. Fortunately for us the folks at the local UPS hub worked some magic and got us our order by 8AM that morning. A little too close for comfort, but it all worked out in the end. We had almost twice as many RSD releases than last year. But we know some people were disappointed that we didn’t have, or we ran out of, the titles they were after. We are sorry about that, but that is the nature of the RSD beast. We would love to make everyone happy, but these items are so limited that it is impossible to do so. We hope you were able to leave with at least one item you were after. If not, then we hope you snagged some good used records that you have been looking for. Thanks again for your continued support. You guys rock. 359 days until Record Store Day 2015. Keep spinning that vinyl! Posted on Thursday, April 17th, 2014 at 5:14 pm. All right boys and girls, Record Store Day is almost here. Just two more days (Saturday April 19th). And we have finally found out what we will be carrying. This list is not in alphabetical order so be sure to scroll all the way down. Keep in mind we might have one copy of a title, we might have multiple copies. And sorry, we can’t hold items. First come, first served. We will be celebrating RSD at our VILLA PARK location (22 S. Villa Ave., inside Cornerstone Used Books). Our hours that day will be 9AM-5PM. We look forward to seeing old friends, and hopefully make some new ones. Please help spread the word! Posted on Friday, March 21st, 2014 at 8:40 am. Record Store Day is almost here, folks! Saturday April 19th is the day. We will be celebrating at our Villa Park location (22 S. Villa Ave.) starting at 9AM. Some very cool limited edition releases are scheduled. We are doing are best to get our hands on as many titles as possible. Before you ask, no…we can’t order for you…and no…we can’t hold items for you. Strictly first come, first served that day. But if there are specific items you are looking for drop us a line at info@cheapkissrecords.com the day before and see if we got that item in. We don’t want you to come out and wait in line if we didn’t get the record in that you are looking for. Stay tuned for more info the closer we get to the date! Year End Sale In Villa Park! Posted on Friday, December 27th, 2013 at 4:28 pm. 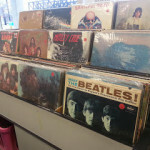 From Saturday December 28th ’til Tuesday December 31st all vinyl at our Villa Park location will be 20% off. Yep, you heard right. 20% off. We just dropped a bunch off, too. So plenty of new records to choose from. The store will be open on Saturday from 9AM until 5PM, Monday and Tuesday 10AM until 6PM. We are at 22 S. Villa Ave., Villa Park, IL. Southwest corner of Villa Ave. and St. Charles Rd. You can find us inside Cornerstone Used Books. Posted on Tuesday, November 26th, 2013 at 8:29 am. Our Villa Park location (22 S. Villa Ave.) will be participating in Record Store Day’s Black Friday extravaganza. The store will be open from 10AM-6PM. We have a number of the limited edition records on order. Sorry, we don’t know yet what we will be getting in. Just like for the regular Record Store Day it is all a crapshoot. And just like RSD, it will be first come, first served. We won’t be able to hold records for you. Record buying event at Sam Ash (Buffalo Grove)! Posted on Tuesday, November 5th, 2013 at 10:30 am. Have a hankering for a new guitar but don’t have the funds? How about a keyboard? Or maybe a P.A. system? Well, if you have a closet full of records that you don’t listen to any more we just might be able to help you out. On Saturday November 9th from 1PM-5PM we will be at the Sam Ash Music store in Buffalo Grove, IL buying record collections. 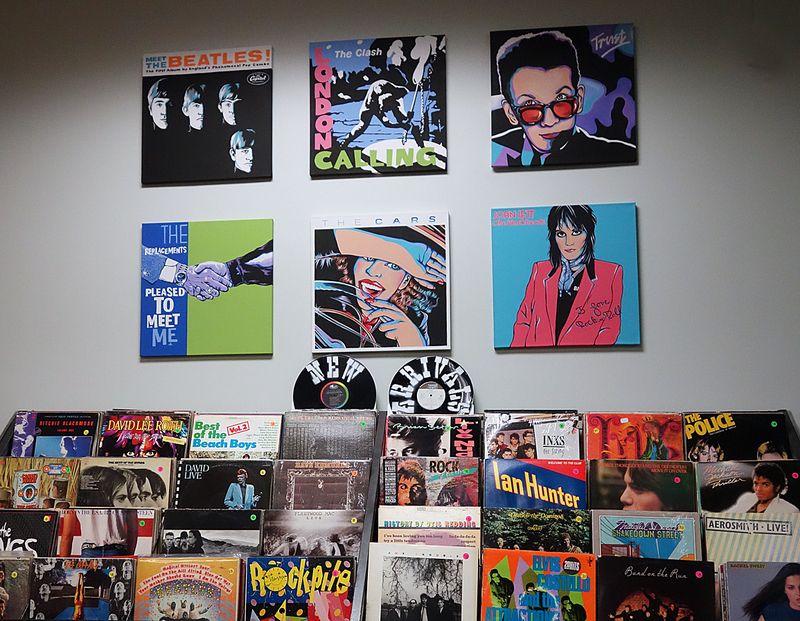 Bring in your records, we’ll appraise them and make you an offer. If you accept the offer, we will give you the agreed upon amount as a Sam Ash gift card. Turn those records you aren’t listening to any more into the musical gear you’ve been craving. We are always looking for ’60s-’80s rock/pop, soul/r&B, punk, metal, and alternative. We are not looking for easy listening (Streisand, Andy Williams, Manilow), soundtracks/showtunes, 78s. Please spread the word to anyone you know that might be up for this offer. Posted on Tuesday, October 1st, 2013 at 10:42 pm. This Sunday (October 6th) we will be at our Villa Park location with cash in hand, waiting to buy your record collection. We will be there from 1:00-3:00. What we are looking for: ’60s-’80s rock, New Wave/Punk, Soul/R&B, Jazz, Metal, Alternative. What we are not looking for: easy listening (Barbra Streisand, Barry Manilow, Andy Williams, Johnny Mathis, etc. ), big band, soundtracks (Camelot, Sound Of Music), organ music, 78s. If you don’t have a turntable anymore, if your records are just gathering dust, let us help find them a new home. Let them be enjoyed they way there were meant to be enjoyed. And please spread the word. Tell family or friends who might be ready to part with their records as well. Thanks! Posted on Friday, September 13th, 2013 at 10:33 am. 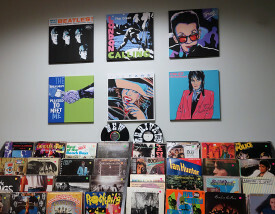 Our next “Vinyl Obsession Night” in Villa Park is this coming Monday, September 16th. We will be there from 6PM-8PM. All vinyl in the store will be 10% off. This month’s theme: Soundtracks. Bring along a couple of your faves, spin some tunes, tell some stories. The more obscure the better. Although we love them, we probably don’t need to hear anything from “Saturday Night Fever” or “Grease”. Dig deep! Labor Day Sale In Villa Park! Posted on Saturday, August 31st, 2013 at 11:57 pm. Posted on Sunday, June 2nd, 2013 at 3:36 am. The long rumored new website has become reality! Long time comin’, right? Give it a look. Poke around. Take it for a spin. Let us know what you think. We hope you like it as much as we do. We have tried to make it as appealing to look at and as easy to use as possible. There’s nothing quite like flipping through records at your favorite record store, but we hope you will find this site to be a more than adequate alternative. Records are going to be added at a brisk pace over the next few months, so please check back often. Record Store Day Is On The Way! Posted on Monday, March 25th, 2013 at 8:03 am. Record Store Day is less than a month away. And you know what? We have too much fun planned to keep it contained to just one day. So we will also be celebrating The Day After Record Store Day as well! We will celebrate Record Store Day on Saturday April 20th (the same day as the rest of the world) at our Villa Park location (22 S. Villa Ave., southwest corner of Villa and St. Charles Rd., inside Cornerstone Used Books) We will be there from 9AM ’til noon. We are trying to get as many exclusive Record Store Day releases as possible. Items are very limited, but we are doing our best. We hope you understand that we won’t be able to get everything on everybody’s wish list. We have placed our order with the distributor. What we wind up getting is a total crapshoot. So fingers crossed that we get what you’re looking for. Also, we will be celebrating The Day After Record Store Day on April 21st at our Schaumburg warehouse (700 Albion Ave.) We won’t be able to bring all of our records to Villa Park, so we’ll just keep them where they’re at and open up on Sunday. We will be there from noon ’til 4:00 on Sunday. Big discounts on all items. And we are very pleased to announce our special guest performer for The Day After Record Store Day will be singer/songwriter/producer Mike Viola. The name might not ring a bell for some, but you know his voice and you have heard his songs. He was the man behind the mic for “That Thing You Do”. Yep, that’s his voice on the title track of the awesome Tom Hanks film. He also wrote songs for “Walk Hard – The Dewey Cox Story”, “Get Him To The Greek” and all sorts of other film projects. He was leader of the band The Candy Butchers and has also released a bunch of stellar solo albums. If you’re a fan of pure pop songcraft, check him out. We are honored that he will be stopping by our HQ. His performance on Sunday April 21st in Schaumburg will begin at 1:00. Posted on Thursday, January 3rd, 2013 at 11:19 am. 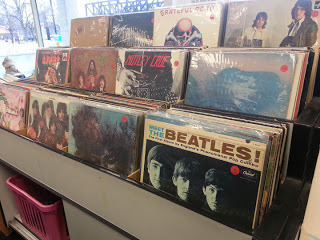 Besides our online store at cheapkissrecords.com, if you’re in the Chicagoland area be sure to stop by our Villa Park location as part of Cornerstone Used Books. It is located at 22 S. Villa Ave. (southwest corner of Villa Ave. and St. Charles Rd.) Open Monday thru Friday from 10-6, Saturdays 9-5, closed Sundays. 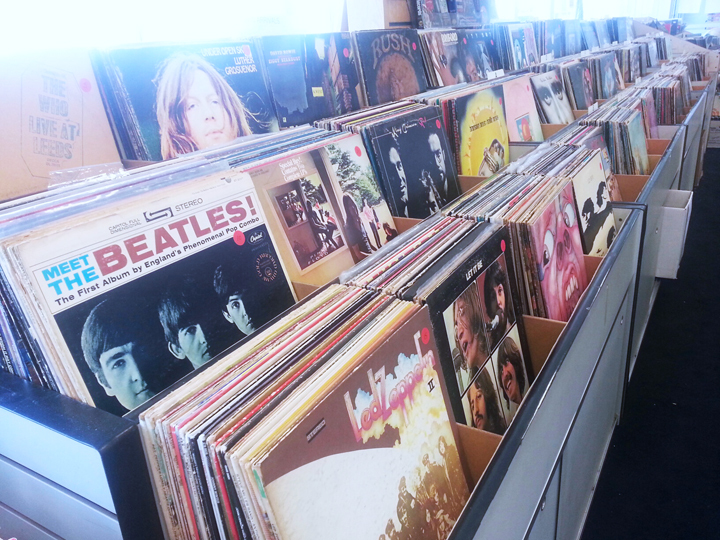 Plenty of cool vinyl to flip through. Thousands of titles from $1 on up.